Hebrew author; born about 1620; flourished in Germany during the latter half of the seventeenth century. He published his "Bet Aharon" (Aaron's House) at Frankfort-on-the-Oder in 1690, being at that time of advanced age. This work, which received the approval of the greatest rabbinic authorities of the time, gives the places in the Talmud, the Midrashim, the Zohar, and many other rabbinic and cabalistic works where each verse of the Bible is either cited or explained. 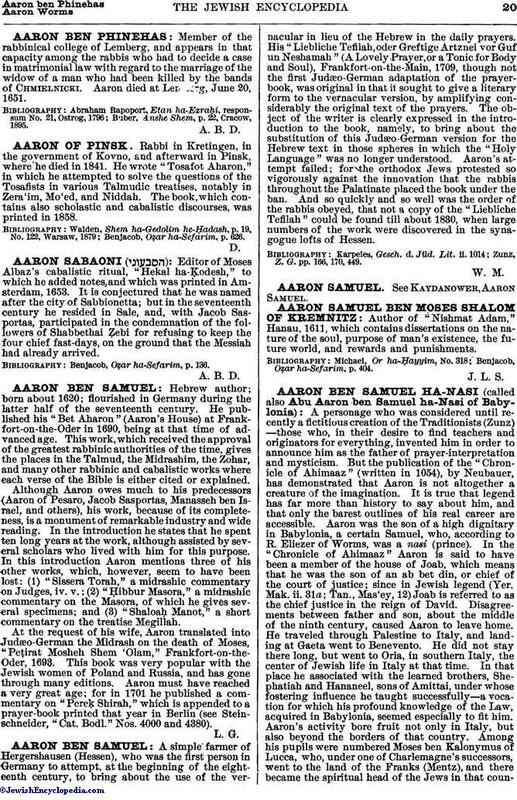 Although Aaron owes much to his predecessors (Aaron of Pesaro, Jacob Sasportas, Manasseh ben Israel, and others), his work, because of its completeness, is a monument of remarkable industry and wide reading. In the introduction he states that he spent ten long years at the work, although assisted by several scholars who lived with him for this purpose. In this introduction Aaron mentions three of his other works, which, however, seem to have been lost: (1) "Sissera Torah," a midrashic commentary on Judges, iv. v.; (2) "Ḥibbur Masora," a midrashic commentary on the Masora, of which he gives several specimens; and (3) "Shaloaḥ Manot," a short commentary on the treatise Megillah. At the request of his wife, Aaron translated into Judæo-German the Midrash on the death of Moses, "Peṭirat Mosheh Shem 'Olam," Frankfort-on-the-Oder, 1693. This book was very popular with the Jewish women of Poland and Russia, and has gone through many editions. Aaron must have reached a very great age; for in 1701 he published a commentary on "Pereḳ Shirah," which is appended to a prayer-book printed that year in Berlin (see Stein-schneider, "Cat. Bodl." Nos. 4000 and 4380).